Malware is constantly evolving, so you need a dynamic security defense that can keep up with the latest Web-based threats. 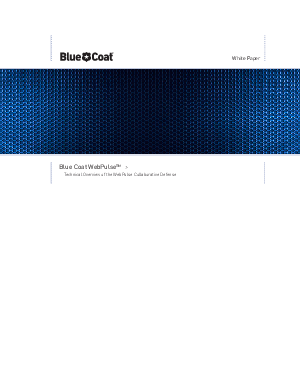 The WebPulseTM collaborative defense powers Blue Coat's Web Security portfolio, delivering fast and effective Web 2.0 threat protection for 75 million users worldwide. WebPulseTM supports more than 50 languages and utilizes a combination of traffic, content and reputation analysis of real-time requests to build a comprehensive view of the web-based malware ecosystem. With custom script analyzers, anti-malware and anti-virus scanning, and sandboxing and browser simulations as well as other proprietary security defenses, WebPulseTM identifies and blocks 3.3 million threats per day. To keep pace with the evolving threat landscape, Blue Coat Security Labs continually adds new defenses to WebPulse that are immediately available to all 75 million users without updates or downloads. Take a look at this techincal overview to see how Blue Coat's defense systems, powered by WebPulse helps organizations get in front of these malware networks.